Demand forecasting is an estimated demand of what will be required to fulfill customer request over a defined future period of time. Knowledge of how demand will fluctuate enables a company to keep the right amount of stock on hand without over stocking or under stocking specified items. If demand is underestimated, sales can be lost due to the lack of products in stock and if demand is overestimated, the business is left with a surplus that can be a financial drain on working capital. Supplier Lead Times: There is always a lead time between the ordering time and the delivery time. Ordering Costs: Due to order cost variance, it’s often necessary to order in large batches to ensure a lower item unit cost. Because of these two factors, businesses need to frequently be looking ahead and forecasting for future demand to stay in front of these two variables. However, it isn’t enough to just forecast your demand. Understanding demand forecast accuracy is equally as important in order to determine how uncertain the forecast will be for a given business period. Additionally, by calculating and understanding your forecast error, you can ensure the safety stock of your inventory is sized correctly to avoid inflated carrying costs and lost sales orders due to stock outs. In this blog series, we will cover how to analyze, categorize and forecast for demand. Companies that can master the following demand forecasting techniques will drastically improve the chances of consistently maintain the right levels of inventory in every warehouse location across an ever-changing business. Understanding demand makes a company much more competitive in the marketplace. Almost every manufacturer or distributor can expect to have seasonal fluctuations in their demand. Everything from holidays to seasonal climate changes influence what demand the market will have for your products. While it is extremely important to account for how seasonal changes effect demand, it may be possible to benefit further from additional analysis. Understanding how seasonal factors effects customer purchasing habits helps businesses position themselves to take advantage for variations in demand. With regard to forecasting, seasonality refers to the portion of demand fluctuation accounted for by a reoccurring pattern. This is identified by the demand pattern repeating systematically over time. Remember that if seasonality is used on an item, the demand should be adjusted before used in the forecast calculation. Best practice is to keep seasonal demand and other variable factors separated from your base demand calculations in order to keep the data clean and easy to use for forecasting going forward. Below is an example of the different demand factors that can impact or inflate your normal base demand. Whereas season fluctuations can be tracked in patterns over time, outliers are less predictable. Unusual demand can be caused by events of which you have knowledge of (e.g., sales promotions, large one-time orders, employee strikes, etc) or can be caused by events of which you have no knowledge of (competitor promotions, customer going out of business, natural disasters, etc). There are different ways to detect outliners, but the important thing is that they get flagged as outliers in your demand forecasting or it can have a significant negative impact on the accuracy of your forecasts. Unusually high or low demands need to be identified as that demand should not to be used when demand forecasting calculations. Safety stock is an addition to basic inventory that serves as a buffer against variability in the supply chain. One of the biggest factors of variability in the supply chain is demand, and demand can be highly unpredictable occurring in patterns from fast to slow or lumpy to erratic as we reviewed earlier in this piece. 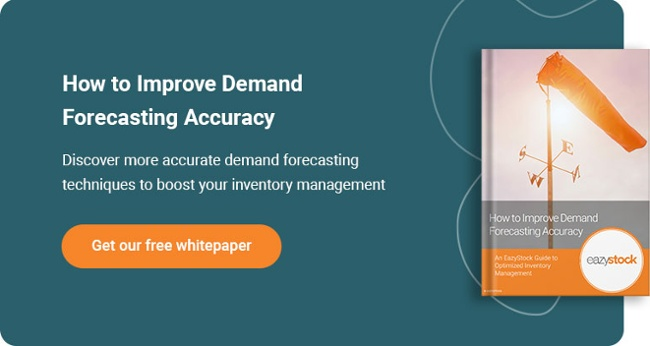 For more detailed information on improving your demand forecasting accuracy, download your copy of our free white paper below and start optimizing!